"Kaldbakur" is a wooden villa with extraordinary and personal design and interiors. The house is built in 1962 but restored in 1981 and again in 2006. The villa is available for vacation rental all year round and sleeps maximum 10 people. Minimum rental is 3 nights. The villa has 4/5 bedrooms. Two double, one twin and two connecting rooms (double+bunker bedroom). It has two bathrooms, living rooms, dining room and a kitchen. The living room has a fireplace and a big screen TV with a DVD and VHS player. In the dining area there is a dining table for up to 12 people and a piano. There is wireless internet in the villa and mobile reception. Parking is available for up to 3 cars in the parking lot. The surroundings of the villa are stunning, where the Icelandic bird-life, trees and flora have been persisting without any restraint. The location of the villa is extraordinary as it has breathtaking view, abundant bird-life, spectacular nature and wildlife, country comfort and urban activities and service in town. 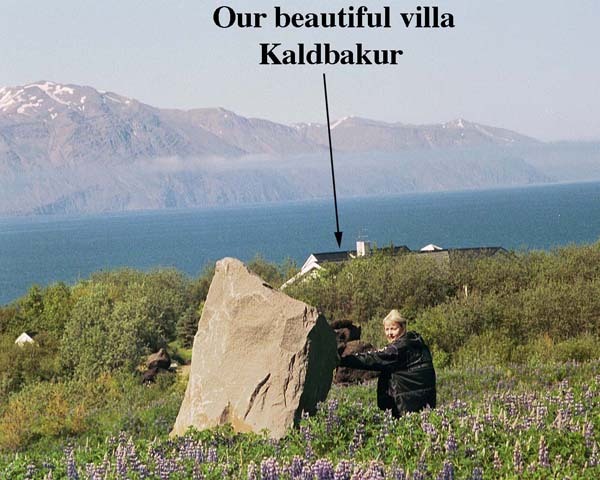 The villa is located on the "Diamond Circle ": The Husavik - Dettifoss - Myvatn - Husavik round trip journey and only 2 km from the town center of Husavik, the Whale Watching capital of Europe.